SENNEBOGEN officially introduced the 875 E-Series at bauma 2013 as a world first. A materials handling machine of this type has been providing reliable service unloading ships for the logistics service provider, Kocaman Denizcilik, at Aksa Port in Turkey. For the owner, the newly developed machine offers double savings in operating costs: on one hand, through the innovative Green Hybrid energy recovery system, and on the other hand, through the efficient electric drive. As a complete provider in the areas of freight logistics and port logistics, the company, Kocaman Denizcilik, founded in 1987, services the Aksa seaports in Turkey and ensures smooth handling of the loading processes. In this regard, with the new SENNEBOGEN 875 an unparalleled machine development has been placed in practical implementation. A sophisticated machine concept, including energy recovery system and electric drive, makes the machine an economical materials handling specialist. The machine, which was delivered in the end of 2013 by the Turkish sales and service partner, Forsen, is used exclusively for unloading coal in Aksa Port. Equipped with a 7m3 double shell grab, approximately 600tph (tonnes per hour) is moved, and with just 30 seconds per cycle, the machine was able to prove its performance capacity within the first days of operation. This SENNEBOGEN 875 was especially developed for the customer’s requirements and adapted to the local conditions. For this the machine was set up on a crawler gantry undercarriage with 5m clearance height and 5.80m track width. In daily operation, the machine unloads arriving ships that deliver coal by the tonne for the adjacent power plants. The existing conveyor belt transports the coal farther along the quay. 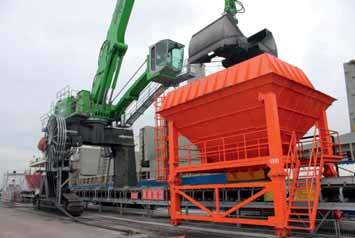 To also enable work above the conveyor belt system, including feed hopper, a mobile crawler gantry variant was selected. This allows flexible work over the entire length of the quay and beyond, and cuts the slewing angle in half, since it is possible to unload coal directly underneath the machine into the funnel — an efficient saving of time and facilitation of work. The SENNEBOGEN 875 E-Series is driven by a powerful 355kW electric motor with a mobile power supply via a laterally mounted cable drum. Operating and service costs savings of up to 50% relative to a conventional diesel machine are achieved through the modern electric drive. Additional advantages are longer maintenance intervals, the fact that fuel stops are dispensed with, and a longer component service life. In addition, the SENNEBOGEN 875 E-Series is equipped with the innovative Green Hybrid energy recovery system. This sophisticated system saves the energy in the system when lowering the boom and makes this saved energy available again for the next lift, virtually loss-free.Through this means up to 30% energy is additionally saved. Operators and the responsible parties at Kocaman Denizcilik have particular praise for the comfortable, elevating Mastercab. Thanks to the elevated position in the cab, which offers an adjustment range of 9m, the operator always has an unobstructed view into the ship’s hull and the feed hopper, as well as all around the entire work area.This is ensured by the continuous panorama windshield, an additional armoured glass floor window, and multiple surroundings cameras.